A Tonk's Tail... err, Tale...: We feel your pain, Faraday. LOL if it is good it is worth waiting for. Have a wonderful Wednesday. It is a rough life, isn't it? May I suggest another bush? You mean you actually WAIT for something, Faraday? Doubly so if there have been introoders! Meow we are voting our paws off! I thought kitties were supposed to be patient? Do we note a very slight air of sarcasm…? The head peep says that this reminds her of the line in the ladies' room at a concert of sporting event or airport... only there's no sniffing there! Holy CAT, you don't think she used up all the sniffs, do you?? We bet she's leaving some extra smells there. Hahaha. What is it with bushes, anyway? It's not like it's Catnip. Uh, don't you think you should give Allie a little bit of PRIVACY??? What's the name of the bush? George? Just read Allie's response to this MOL... You look very patient Faraday! 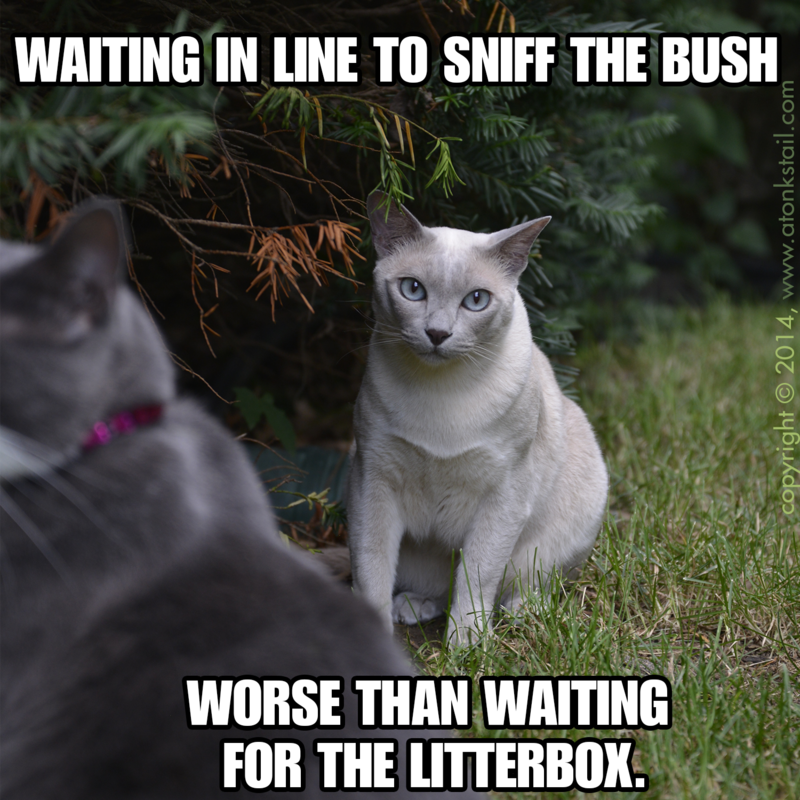 I hope she doesn't take too long or the sniff might have worn off by the time you get there.